Fish-filled sensory bins, crafts, and manipulation ideas plus activities for babies, and so much more! 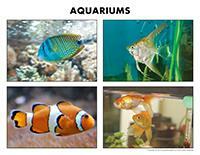 (Open thematic poster-Aquariums) Print, laminate, and display all kinds of posters. (Open educa-theme-Aquariums) Print and laminate the items that represent the theme. Use them to present your theme to your group (and parents) while decorating a corner of your daycare. 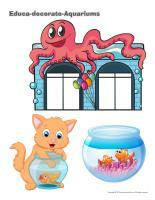 (Open educa-decorate-Aquariums) Print, laminate, and cut out the various items. Use them to decorate your daycare and set the mood for the theme. (Open models-Aquariums) Print and let children decorate the garland. Cut it out and hang it within your daycare or near your daycare entrance. 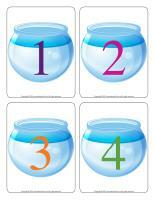 (Open educa-numbers-Aquariums) Print and laminate the various cards. Display them on a wall to decorate your daycare throughout the theme. 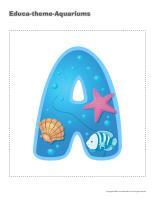 (Open stickers-Aquariums) Print on adhesive paper to create a series of original stickers that can be used to reward children. Hang several plastic or construction paper fish from the ceiling before children arrive. Create your own special hat by gluing colourful fish on a straw hat and wear it to greet children in the morning. If you are lucky enough to have an aquarium within your daycare, invite children to observe the fish with you. Otherwise, you may choose to purchase a fish bowl and a simple goldfish. Children will love to feed it! They will be just as intrigued by a plastic fish if that's what you have on hand. Show them fish pictures or illustrations. Find books about fish and use a fish puppet to discuss the many interesting characteristics of fish with your group. This special tool was created in response to a special request received. (Open group identification-Fish) Print and laminate the various cards and posters and use them to identify children's spots and belongings. (Open Poni discovers and presents-Aquariums) Print the various cards. Laminate them and cut them out. Use a Poni puppet or another puppet children are familiar with to introduce the pictures to your group. If you wish, you may wear a fish costume too. The pictures may be used as a memory game or to spark a conversation with your group. Use them to decorate your daycare or a specific thematic corner. 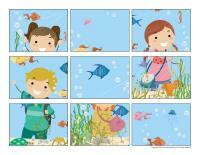 (Open picture game-Aquariums) Print, laminate, and store the pictures in a Ziploc bag or in your thematic bin. 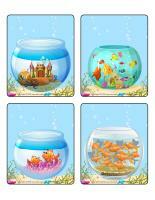 (Open picture game-Aquariums) Print the pictures twice and use them to play a memory game with your group. 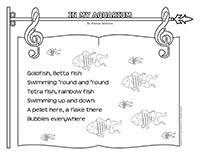 (Open activity sheets-Aquariums) Activity sheets are suggested for each theme. Print and follow instructions. 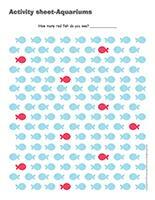 (Open writing activities-F like fish) Print for each child or laminate for use with a dry-erase marker. 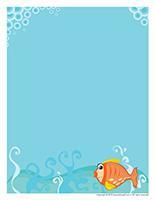 (Open stationery-Fish) Print. You may use the stationery to communicate with parents, in your writing area, or to identify your thematic bins. Set a small plastic or inflatable kiddie pool in your area and encourage children to build various items inside it. If you wish, you may also add tiny pebbles or plastic fish to the pool. Fish, plastic aquatic plants and seaweed. These items are easy to find (and inexpensive) in big-box and dollar stores. Cut yellow, red, and green fish out of construction paper. Glue them on plastic bins. Encourage children to sort blocks by depositing them in the bin with the fish of the corresponding color on it. Add sand or salt to your poster paint to create special effects. Provide liquid glue (that can be applied using a paintbrush) and a small container filled with sand. Encourage children to draw sandy designs. Fish-shaped crackers that can be used for collages. Poster paint and bubble wrap (used to transport fragile items) or a solar blanket section. Press the bubble wrap in paint and then on a fish outline (printed on heavy paper). Coloring pages representing fish in an aquarium. Have one child begin a fish drawing and have another child complete it. Clear plastic bottles filled with a mixture of water and blue food coloring (different shades of blue). Use magnets, construction paper fish, simple fishing rods, and paperclips for a simple fishing game. Use this activity to explore different sizes and colors with your group. 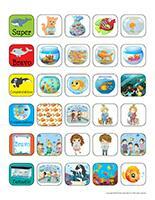 A memory game involving fish pictures or illustrations. A Lite-Brite or MagnaDoodle game for creating fish. Picture books and storybooks related to the theme. Laminated fish outlines that children can trace using dry-erase markers. An obstacle course throughout which children can pretend to swim like fish. An obstacle course throughout which children must collect plastic or construction paper fish. Set exercise mats on the floor and invite children to pretend they are swimming like fish. Use adhesive tape to draw two parallel lines on the floor. Deposit several construction paper fish between the two lines. Invite children to hop over the river without touching the fish. Set three different plastic containers in different locations within your daycare (one close to you, one in the centre, and one at the other end of the daycare). Fill the containers with water. Provide small plastic fish and encourage children to toss them inside the containers. This activity can also be done outdoors. Fill a container with water and add tiny pebbles to represent an aquarium. You may use an actual aquarium, but a simple clear plastic container can also do the trick. A few plastic aquatic plants can also be added along with plastic fish (see fishing section of big-box stores). Fill a container with blue sticky substances (Jell-O, a mixture of baby oil and blue food coloring, etc.). Let children manipulate the contents of the bin with various containers they can fill and empty, kitchen utensils, plastic marine animals, etc. Provide a water table children can explore. Add small boats, plastic fish, and other floating objects. Prepare cookie dough and use fish-shaped cookie cutters to create a variety of edible fish. Cut the bottom of an empty individual yogurt container. Glue plastic film on the bottom of the container and encourage children to use it to observe the bottom of your water table or aquarium. Do they see things differently? 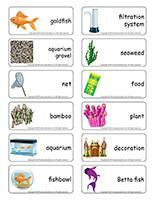 (Open word flashcards-Aquariums) Print and laminate the word flashcards. Encourage each child to pick a word flashcard and present the word to the group (example: net). Ask children questions to get them to talk. (Open giant word flashcards-Aquariums) Print, laminate, and display the word flashcards on a wall, close to your circle time area or on a large piece of cardboard that can be moved around. Name a word and ask children to identify the corresponding flashcard. (Open felt board game-Aquariums) Print. Glue four pieces of dark blue felt on a large piece of cardboard to create your felt board. Display it on a wall. Trace the shapes on colourful pieces of felt and cut them out. The shapes will stick to your felt board. (Open transition games-Aquariums) Print, laminate, and secure the illustrations on the floor to create a path which leads to areas frequently visited by children such as the bathroom or cloakroom. If you prefer, the illustrations may also be used to delimit your various workshops. (Open transition games-Aquariums) Print two copies. Laminate and cut out the cards. Glue one copy of each card on the table using adhesive paper. Drop the other copies in a bag. Children take turns picking a card to determine their spot at the table for the day. You may also use the cards to determine naptime spots or for your task train. Practice making fish-like "sounds" with little ones by encouraging them to imitate you. If you wish, pursue the activity by making other animal sounds. Fill a kiddie pool with colourful balls and hide plastic fish among them. Young children will enjoy finding (and hiding) the fish over and over again. You can use a clothing hanger, tree branches, or wooden skewers (cut pointed ends) to make a mobile. Cut strips of construction paper (3 cm x 10 cm) and fold them to form fish shapes. Use a stapler to hold the shapes in place. Attach a piece of string to each fish and hang them from the hanger/skewers/branches to complete your mobile. Collect a variety of clear plastic containers (mayonnaise, peanut butter, etc.) and fill them with a mixture of water and food coloring. Add tiny jelly fish to each one. Babies will love manipulating these tiny aquariums. Be sure to seal the lids with hot glue and supervise the activity. Variation: Set the bottles in the refrigerator before letting children manipulate them to provide them with the opportunity to explore a cold sensation. (Open fish game) Print six copies. Laminate the illustrations and stick them on the floor so that children can hop from one identical fish to the next (example: from one red fish to another red fish). Name a color. Children must try to go from one end of the daycare to the other, hopping only on fish of the corresponding color. 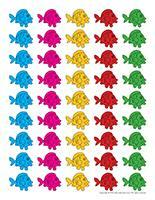 Variation: Use one fish of each color per child (example: for six children, use six red fish). Play music and encourage children to dance around the daycare. When the music stops, name a color. Children must quickly find a fish of the corresponding color to stand on. Fill a kiddie pool with water. Give each child a plastic fish and a drinking straw. Organize races where children must make their fish go from one end of the kiddie pool to the other by blowing through their straw in the water or in the air. Build a maze-like obstacle course using, among other things, a rope strung between two chairs under which children must crawl. If you prefer, you may also have them jump over the rope, without touching it. You can also set a bucket filled with water on a chair and have children crawl under it without spilling it. Incorporate whatever you have on hand and encourage children to help you build your obstacle course. Be sure to create your obstacle course so that you maximize the ways children must move about (hopping, crawling, spinning, etc.). (Open miniature fish) Print and laminate. Hide fish within your daycare and invite children to search for them. The child who finds the most fish can hide them for the next round. Divide your group into two teams: the red fish and the blue fish. Have the red fish stand, facing the wall, at one end of your daycare. The blue fish slowly move towards the red fish. When you shout, "Watch out for the blue fish! ", the red fish turn around an run away to avoid getting caught. (Open picture game-Aquariums) Print and stick the illustrations here and there, on the floor of your daycare. You must have one illustration less than the number of children in your group. (for nine children, use eight illustrations). Children dance around the daycare to the sound of music. When the music stops, they must quickly find an illustration to stand on. The child who is left without an illustration is eliminated. Continue until there is only one child left. For this activity, you will need a parachute (or blanket) as well as a few rings (or other objects that are easy to grab hold of). Set your parachute on the floor, on top of the rings. Invite children to dive under the parachute to collect rings. Who will capture the most rings? Give each child two pieces of blue party streamers (different lengths). Show them how they can take turns standing and waving the streamers high in the air to create a "wave" like we see at sports events. For added color, use different shades of blue. Cut several different sizes of fish out of colourful construction paper. 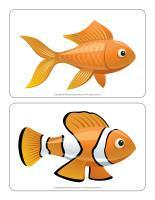 (Open variety of fish models) Print and laminate. Slide a paperclip onto each fish. Attach a magnet to the end of a string and tie the other end around a wooden stick to create a fishing rod. Set two baskets on the floor, one for big fish and one for small fish. Children take turns catching a fish and placing it in the correct basket, depending on its size. Let children perform somersaults on exercise mats and encourage them to end with original poses. Blow bubbles and invite children to run after them and pop them. Set three hula hoops on the floor in a line (or use jumping ropes to trace three circles). Invite children to form a circle around the hula hoops and take turns jumping inside the circles to the sound of music. 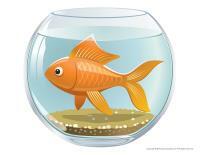 When the music stops, if a child is inside one of the circles, he/she must pretend to swim like a fish in a fishbowl. (Open models-colourful fish) Print and laminate. Make a hole at the top of each fish and thread a piece of string through it. For each child, tuck a string inside their pants so that the fish touches the floor. The goal of the game is to step on a child's fish to make the string fall out of his/her pants. 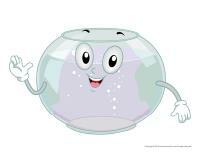 (Open Game-Fishbowls) Print and laminate the fish for durable, eco-friendly use. Before starting, hide the fishbowls in your backyard. Give each child a fish. When you give them the signal, they must find the ten fishbowls that are the same color as their fish and deposit them in a predetermined location. This activity can also be done indoors. Sit in a circle with your group. To the sound of music, children pass one or several plastic fish around the circle. When the music stops, children keep the fish they are holding. The music starts again and the game continues. 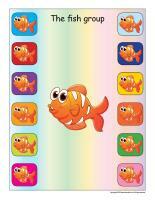 At the end of the game, help children count their fish to determine a winner. 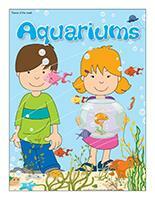 (Open educ-puzzles-Aquariums) Print and laminate for durable, eco-friendly use. Encourage children to place the pieces in the right spots to complete the scene. 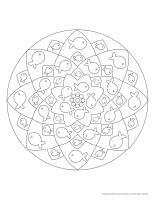 (Open mandalas-Aquariums) Print for each child. Encourage children to color the mandalas to provide them with a calm activity. Pour aquarium gravel on the bottom of a container. Add figurines and plastic fish and let children play with small nets. To create "dry water" shred different shades of blue paper. Use the shredded paper to fill a plastic container. Let children play in the container with tiny fish and other ocean-related items. 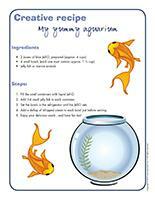 (Open creative recipe-My yummy aquarium) Print and add this recipe to your recipe binder. Add 3-4 small jelly fish to each container. Set the bowls in the refrigerator until the Jell-O sets. Add a dollop of whipped cream to each bowl just before serving. Enjoy your delicious snack...and have fun too! (Open puppets-Aquariums) Print the various puppet models on heavy cardboard. Ask children to cut them out and decorate the puppets with different arts & crafts materials. Stick a Popsicle stick behind each one to complete your puppets. (Open models-Aquariums) Print the models and use them for your various activities and creations throughout the theme. Organize a group project. Trace a large fish shape on a piece of paper and fill it with glue. Press aquarium gravel in the glue. If you wish, create several fish and display them on a wall to create a mural that resembles an aquarium. (Open models-Big fish) Print and trace a large fish on two pieces of construction paper, felt, or other material. Cut both shapes out at the same time. Use a stapler or hot glue to seal the contour of the fish, leaving an opening that will make stuffing the fish with newspaper, tissue paper, or tissues possible. When you are done, seal the remaining section. Let children add wiggly eyes and sequins to represent fish scales. Give each child a paper plate (or a Styrofoam plate). Remove approximately ¼ of the plate to represent your fish's mouth. Glue this cut piece at the other end of the fish to represent its tail. 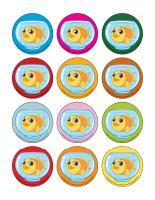 Encourage children to tear pieces of colourful construction paper they can stick on the fish to represent scales. Don't forget to add an eye! Cut a potato in two. Cut a fish shape out of one half. In fact, you must remove the contour of the fish shape so that the fish shape sticks out by about 1 cm. Invite children to dip your homemade stamp in paint and then press it on paper to create fish designs. Trace each child's hand on a piece of paper, with their fingers held close together and their thumb stretched out. Their thumb will represent a fish's fin. Invite children to cut out their fish shape and decorate it. (Open creative coloring-Fish) Print for each child. Encourage children to complete the drawing. 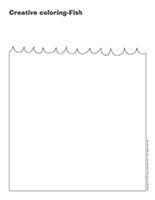 (Open coloring pages theme-Aquariums) Print for each child.